Crewe and Port Vale shared the points on the opening day of the season. 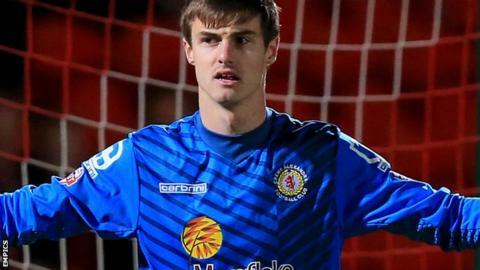 Crewe had goalkeeper Ben Garratt to thank on the stroke of half-time, as he denied Louis Dodds and Sam Foley to keep the scores level. The second half saw Port Vale continue to have more chances, but brave blocks from Ben Nugent kept Crewe in the game. Vale were the better side but were unable to take their chances as Crewe kept them out to earn an opening-day draw at Gresty Road. Match ends, Crewe Alexandra 0, Port Vale 0. Second Half ends, Crewe Alexandra 0, Port Vale 0. Attempt missed. Byron Moore (Port Vale) left footed shot from the right side of the box is close, but misses to the left. Corner, Crewe Alexandra. Conceded by Carl Dickinson. Foul by Ebo Andoh (Port Vale). Attempt saved. Ebo Andoh (Port Vale) right footed shot from outside the box is saved in the bottom left corner. Corner, Port Vale. Conceded by Billy Bingham. Substitution, Crewe Alexandra. Chris Atkinson replaces Adam King. Billy Bingham (Crewe Alexandra) is shown the yellow card for a bad foul. Foul by Billy Bingham (Crewe Alexandra). Substitution, Port Vale. A-Jay Leitch-Smith replaces Uche Ikpeazu. Foul by Uche Ikpeazu (Port Vale). Attempt saved. Uche Ikpeazu (Port Vale) left footed shot from the centre of the box is saved in the bottom left corner. Substitution, Port Vale. Michael Brown replaces Sam Foley. Substitution, Port Vale. Ebo Andoh replaces Sam Kelly. Substitution, Crewe Alexandra. George Cooper replaces Marcus Haber. Attempt missed. Ryan Colclough (Crewe Alexandra) left footed shot from outside the box misses to the left. Attempt blocked. Billy Bingham (Crewe Alexandra) left footed shot from outside the box is blocked. Lauri Dalla Valle (Crewe Alexandra) wins a free kick in the defensive half. Attempt missed. Ryan Colclough (Crewe Alexandra) right footed shot from outside the box misses to the right. Billy Bingham (Crewe Alexandra) wins a free kick in the defensive half. Substitution, Crewe Alexandra. Ryan Colclough replaces Bradden Inman. Corner, Port Vale. Conceded by Jon Guthrie.